A creamy shrimp blend served with our chipotle chips. 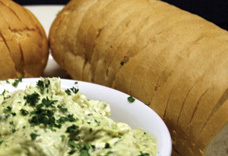 The house favorite served with toasted French bread. A dozen wings served with our homemade bleu cheese. They are available in mild, medium, hot, too hot, or bbq. Tender white meat chicken, southern battered and fried. Served with honey mustard. 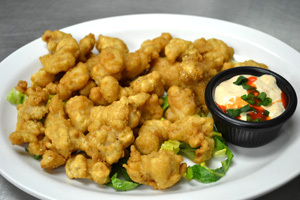 A mixture of our crispy fried crawfish tails and fried shrimp. Served with remoulade. Eight large shrimp, low-country boiled, served with cocktail sauce. A Crawdaddy’s favorite! Cajun battered and fried. Served with remoulade. Crispy fried and topped with our lump crab cream sauce. A Southern tradition! Portobello mushrooms stuffed with our delicious shrimp dip. Blue lip mussels, sautéed in a tomato wine sauce. Served with grilled French bread. Two cakes made with lump and claw meat. Served with mixed greens and remoulade. Fried in our southern cornmeal. Served with remoulade. Served in a tomato-clam wine sauce with grilled french bread. 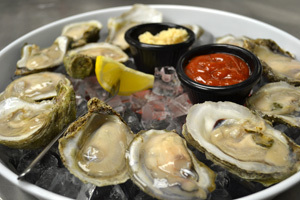 Fresh gulf oysters served with the trimmings. Fried chicken on top of a garden salad with your choice of dressing. 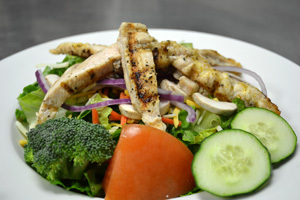 Tender blackened or grilled chicken on top of our garden salad with your choice of dressing. 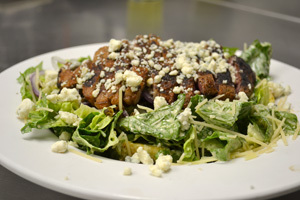 Blackened ribeye on top of our homemade caesar salad with red onions, fried capers & bleu cheese crumbles. Fresh tomatoes, cucumbers, broccoli, carrots, onions, mushrooms, cheese, croutons and romaine. Creole style with pulled pork, sausage, okra and white rice. A creamy blend of shrimp and seafood stock. Available ½ sandwiches are turkey, fried chicken, crawfish, shrimp, catfish, and oyster. Add shrimp, chicken, or Andouille sausage for $1.49 each. Made with Andouille sausage. Warm & spicy! 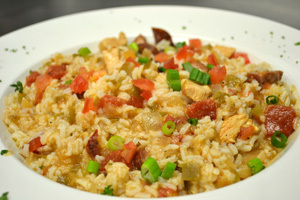 Sample each of our Crawfish Etouffee, Jambalaya and Red Beans & Rice. Served with kettle style potato chips. Add $1 for french fries. Enjoy your favorite sandwich as a wrap with a flour chipotle tortilla, add $.50. Served on Gambino’s French bread with remoulade. Slow-roasted beef with horseradish and jack cheese on Gambino’s French Bread and au jus. Sautéed onions and peppers, topped with jack cheese, served on Gambino’s French Bread. Grilled ribeye served with jack cheese on French bread and au jus. Served with jack cheese, lettuce & tomato on a Kaiser. Fried chicken tossed in our mild wing sauce, served on a Kaiser with bleu cheese. Add $1 for bleu cheese crumbles. Served with smoked cheddar, lettuce, and tomato on a Kaiser. Our 1/2 lb burger with bacon, sautéed mushrooms and onions, smoked cheddar, and our etouffee sauce! Turkey, bacon, jack cheese and pesto spread with tomato vinaigrette on Gambino’s French bread. Portobello mushrooms with jack cheese and parmesan vinaigrette on Gambino’s French bread. Fried green tomatoes, lettuce, and bacon Po Boy with remoulade. Grilled Mahi wrapped in a chipotle floured tortilla with mango salsa, lettuce, and a lemon-basil aioli. Tender white meat Southern battered and fried. Served with french fries and one side item. A tender, boneless, skinless breast, grilled and glazed with our house bourbon sauce. Served with your choice of two side items. A 10oz. chicken breast topped with a pesto spread and parmesan cheese. Served with your choice of two side items. A 10oz. 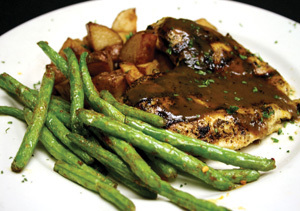 chicken breast, covered with sautéed onions, green peppers, and our pepper supreme sauce, topped with jack cheese. A tender grilled chicken breast topped with our house bbq sauce and smothered with jack and cheddar cheese and bacon bits. Served with your choice of two side items. Grilled or blackened chicken served over fettuccini alfredo. Sautéed shrimp served in a garlic, white wine sauce over fettuccini. 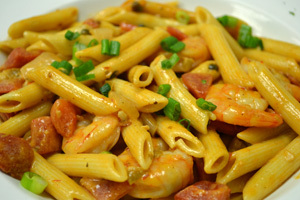 Sautéed shrimp in a chipotle-tomato cream sauce and served over penne pasta. Spicy! Our steaks are hand-cut fresh every day. 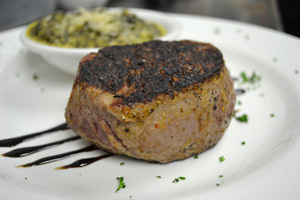 We think we have the best steaks in town! Served with your choice of two side items. A blackened or grilled 8 oz filet mignon with four of our pan seared scallops or six grilled shrimp. An 8 oz center cut, choice tenderloin topped with our lump crab cream sauce. A 22 oz. bone-in ribeye cooked to your liking. A 13 oz choice ribeye cooked to your liking. Grilled and covered with sautéed Portobello and button mushrooms. Grilled and finished with our house bourbon glaze. 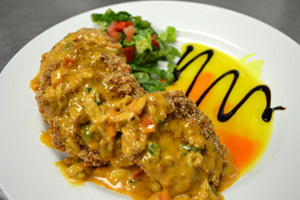 Tenderloin medallions topped with our Madeira wine cream sauce. A 13 oz blackened ribeye topped with six honey-chipotle glazed shrimp. 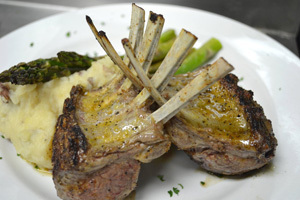 Slow-roasted New Zealand rack of lamb served with a balsamic - honey soy reduction. Seasoned and grilled to perfection. 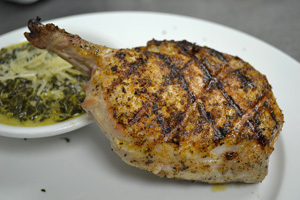 One of the best pork chops ever! A 24 oz. porterhouse, broiled at 1600 degrees. This PRIME graded steak is the only prime graded beef offered in the Upper Cumberland. An 8 oz filet grilled or blackened to order. Served with your choice of two side items. Grilled and served with a lemon basil cream sauce on top of a bed of rice. Served with your choice of two side items. 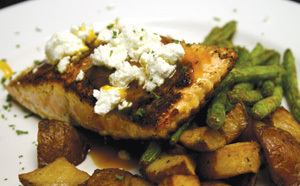 Pan-seared with an orange ginger sauce and topped with goat’s cheese. Served with your choice of two side items. Two 4 oz yellow-fin tuna medallions, pan-seared with a honey-soy reduction. Served with your choice of two side items. A dozen of our seasoned grilled shrimp. Served with your choice of two side items. Sautéed with loads of garlic and white wine. Served over a bed of rice with your choice of two side items. 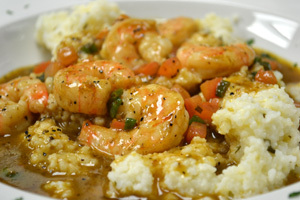 Lemon spiced shrimp over garlic cheese grits with fried okra. A New Orleans Classic! Scallops, shrimp, and sausage sautéed in a Creole cream sauce over a bed of rice. Served with your choice of two side items. Jumbo sea scallops pan-seared with our special seasoning. Served with your choice of two side items. Two catfish filets, pan-seared, and topped with our lump crab cream sauce. Served with your choice of two side items. Three of our homemade lump and claw meat crab cakes with remoulade. Served with your choice of two side items. • Shrimp • Crawfish • Catfish - Served with French fries. A 12 oz. spiny lobster tail, broiled and served with drawn butter, on a bed of cajun rice with your choice of one side item. The New Orleans classic with bourbon crème Anglaise. With raspberry or chocolate sauce. A southern pecan cobbler served with vanilla ice cream.